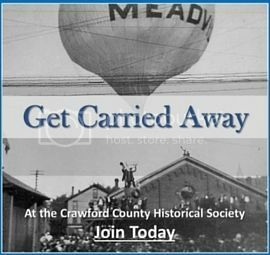 As colorful balloons fill the skies over Crawford County for the annual Thurston Classic, it’s always a worthwhile venture to dig into the histories of father and son, Samuel and Alic (sometimes Alex) Thurston, the area’s early balloonists for which the event pays homage to. Many are familiar with a handful of harrowing stories about their aerial exploits, but a fuller history of the two demonstrates a level of fearlessness reserved only for true daredevils. Samuel Sylvester Thurston, nicknamed “Vet,” was born in 1834 in Randolph Township where he grew up on his father’s farm. Samuel would later marry Phoebe Jane Fairbanks of Massachusetts, and the two became proprietors of the Crawford House, a fashionable hotel in Meadville. 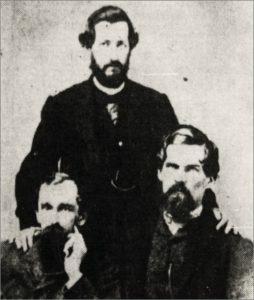 The couple were known for their hospitality which drew in many guests to include “Professor” John H. Steiner, the famed German-born balloonist who later serve in the Union Army Balloon Corps under Thaddeus S. C. Lowe. At the time of his stay in 1860, Professor Steiner had already earned a reputation for fearlessness. In 1857, he attempted to cross Lake Erie in a balloon that caught fire and plummeted into the water. Steiner would go on to cross Lake Ontario and even thrill one crowd by jumping from a balloon two miles high and float to earth using a parachute. Steiner’s stories, no doubt captured Samuel’s attention as he soon acquired a balloon of his own after the Professor agreed to train the eager pupil. Despite months of jeering by local residents and hotel patrons, Samuel announced July 4th, 1860 would be the date of his first official exhibition flight for the public. During Meadville’s Independence Day celebration, a curious crowd gathered at the Diamond to witness Samuel’s maiden flight. To their enchantment, Samuel’s balloon lifted gently into the air and drifted 12 miles east before descending just outside Townville. The landing did not come without some excitement, however, as the grappling hook used to help bring the balloon to a stop, caught on the corner of crudely built farmhouse and ripped the kitchen from it from its flimsy foundation, revealing a startled family sitting in their chairs on a dirt floor. 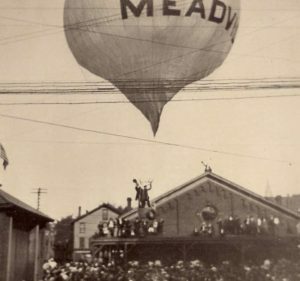 Balloons of that day were relatively simple, constructed of lightweight oiled silk or muslin which was filled with coal gas, also used for lighting the street lights in Meadville. The bulbous balloon was encased in a netting, gathering at a ring below from which the wicker basket carrying the pilot hung. Like today, balloons were tied down as they were filled with gas, and should a stiff wind threaten to destroy the secured balloon, ripcords were available to immediately deflated it to prevent it from bursting. Sandbags were the popular means to provide ballast and woe to anyone who may have been standing below when any of these bags were dropped from above. Descending was done by releasing gas from a small vent at the top of the balloon, but at certain heights determining whether you were rising or dropping was sometimes difficult. One method was to toss a piece of paper from the basket; if the paper dropped then you were still ascending and if it rose up, you were descending. Samuel’s exhilarating first flight served to fuel his desire for more. The new “Professor” hung block printed posters on buildings advertising flying demonstrations, and like many of his contemporary aeronauts, he began racing at public events. In 1867, he and eight other balloonists raced one another and put on a week-long exhibition for crowds in Pittsburgh. Winners for such races were determined by which balloon disappeared first from site in the sky above, and Samuel would go to extremes to win. In one race against a man from Cincinnati, he found himself quickly falling behind after running out of ballast to drop. With his competitor still rise quickly, Samuel crawled into the netting ring and cut the ropes carrying the wicker gondola. The bold move caused the balloon to soar rapidly upward. Seconds later, Samuel was declared the winner. The exhibition was the perfect setting for another spectacle after a local woman was offered $500 is she would get married while in balloon. Agreeing to the stunt, the woman selected Samuel as her pilot. At the appointed time, she and her betrothed along with the minister climb into the gondola and the ropes were loosened, allowing the balloon to raise 10 feet. Upon the ceremony’s completion, Samuel switched places with the minster and took the newlyweds skyward. The bride, it seems, was an adventurous type who continually implored Samuel to take the balloon ever higher, which he obliged until they reach an altitude so high, his nose began to bleed. 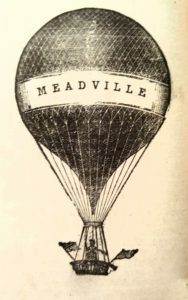 Samuel eventually would have two balloons he could operate, at least one of which he constructed himself using 576 yards of cloth which he christened “Meadville” in large white letters on the balloon’s outer periphery. In the years to come, he would enthrall crowds in the thousands, and on July 4, 1885, 25 years to the day of his first public performance, Samuel made his 215th recorded flight. It what would turn out to be his last. An unknown illness kept him grounded, and three years later he died. Alexander “Alic” Thurston was born a year after his father fell in love with ballooning. There is conflicting information as whether Samuel ever took his son up for a ride, but whatever the case, Alic shared his father’s fascination for flight and his exploits would be even more extreme. In keeping with tradition, Alic’s maiden flight in public occurred on July the 4th, 1891, three years after his father’s passing. Enthusiasm was high for the second-generation aeronaut, and as in celebrations before, the Diamond was filled with eager onlookers who unknowingly were about to have their breath taken away. Minutes later Alic along with, passenger, Charles Stewart, climbed into the gondola below the towering balloon and waved to the crowd’s cheers. Upon Alic’s signal, the balloon was at last released from its mooring across from the Baptist Church and the two men rose slowly into the summer air. Cheers, however, soon changed to gasps as the balloon failed to clear the nearby electric lines. Sparks showered into the air as the electric current carried through the wires burned through several of the ropes, securing the gondola. Alic was dumped from the carriage, but amazingly, grabbed a dangling guy rope and hoisted himself back inside where he managed to tug the airship free from the wiring. With the gondola slightly askew the balloon lifted skyward once again, floating above Chestnut Street. The ordeal, however, was not over. A sudden downdraft struck the balloon as it crossed over Liberty Street, knocking the basket into the chimney of the Alfred Huidekoper home. The violent collision threw both Alic and Charles from the basket, their 20-foot fall broken only by the apple trees directly below. The balloon, unencumbered by riders traveled 65 miles away. All told, both Alic and Charles were unharmed and appeared before the crowd, safe but no doubt embarrassed. Alic also took on the title of “Professor,” and his future flights on Independence Day much were more successful. In 1896, Alic and Leonard Smith lifted from the Diamond, soaring to a height of 2 miles while flying 13 miles before landing just west of Guys Mills, only 22 minutes later. The recorded feat set a speed record at the time. With his disastrous first flight in the back of his mind, Alic focused on flying balloons of his own design. Using his barn across the road from his house as his hangar, Alic cut a circular hole in the barn’s main floor to create an opening that extend from the basement to the rafters. From here Alic could work, using a new method to partially inflate his balloon in the open gap. Hydrogen had replaced the old street lamp gas, and Alic produced his own from sulfur to fill his balloon. 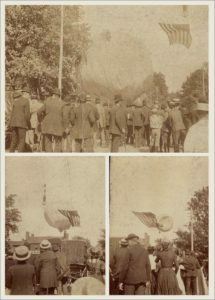 On Labor Day 1908 Alic revealed a 65-foot high behemoth, bearing the same name his father’s balloon once had—Meadville” Alic’s version, though, dwarfed his father’s original by nearly twice the size, using 1,100 yards of Lonsdale muslin to contain 35,000 cubic feet of gas within the Meadville’s 120-foot circumference. Alic launched his balloon from the roof of the Meadville Marketing House which only added to airship’s immensity. 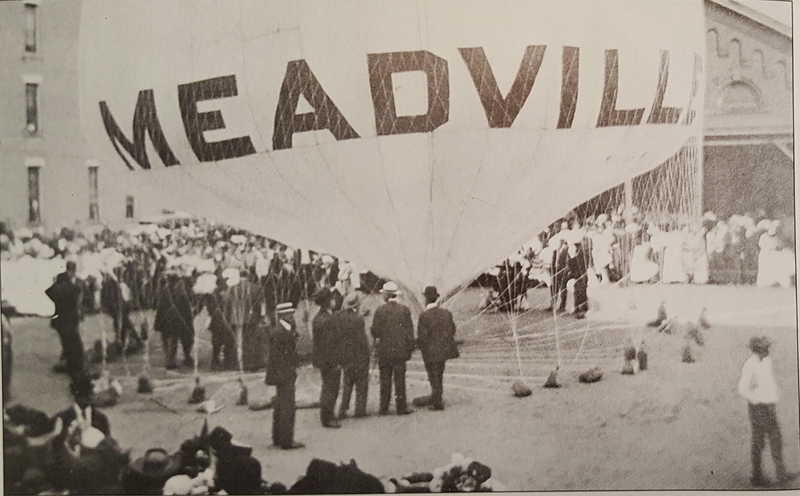 The Meadville’s maiden flight occurred without incident much to the delight of the shrinking crowd below which included faculty and students of Allegheny College who had shown up earlier to study the engineering principles behind the airship’s functionality. Given its increased capacities, the Meadville afforded Alic some new feat of accomplishment. Alic pushed the balloon to test its limits, once ascending to over 19,000 feet. On 27 May 1910, Alic and Harry E. Fabel left Meadville at 3 AM with an electric torch affixed to the bottom of the basket to help with propulsion. Ten hours later the pair landed deep in Cameron County, a distance of 175 miles as the crow flies, but given the meandering route dictated by the prevailing wind patterns, was in reality, 250. Naturally, area residents wanted to experience the same thrill of flight as Alic, and he was just as eager to share the feeling, offering rides at public event and venues. Evening rides were a regular feature for a time at Oakwood Park, and Alic took paying riders up over Conneaut Lake at Exposition Park for the 1910 and 1911 seasons. While most passengers were treated to the standard experience, others got more than they may have anticipated. During one flight at Exposition Park, a gale blew Alic and his passengers, and dunked them in the lake several times before he could regain control. On another occasion, Alic and a passenger, “stuck” in a windless standstill above Sandy Lake, decided to settle in for the night, but not before throwing a grappling hook over the side as a precaution. In the early morning hours, a breeze did kick up carrying the balloon over land where the grappling hook moored them to a farmer’s corncrib, but not before dragging his chicken coop for some distance in the process. In 1913 Alic retired from piloting balloons. He had begun focusing his time on running the Thurston’s Carbonated Mineral Springs not far from the Ponce de Leon Mineral Springs. At one point the company ran five trucks full of mineral water for delivery to Meadville before the city installed water service. 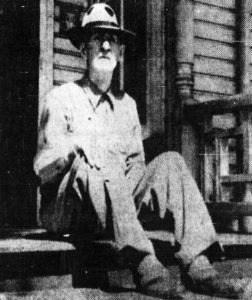 Alic also kept up with the family dairy farm located near the present day Meadville Rec Center along the road the city named in his honor–Thruston Road. Ballooning to Alic, must have carried with it an almost spiritual experience, a characteristic developed over many quite hours aloft and punctuated by more than a few near-death experiences. Alic Thurston died at Spenser Hospital on March 22, 1955 at the age of 93 and was buried with his father in Greendale Cemetery. Ron Mattocks was born and raised in Guys Mills, Pennsylvania. Following high school he joined the Army to see the world (which he did) before a career as an executive with a national home builder in Texas. Eventually Ron switched to Internet marketing, consulting for companies such as GMC, ConAgra, Mattel, and others. During this time he also published the book, Sugar Milk: What One Dad Drinks When He Can’t Afford Vodka and began writing regularly for the Huffington Post, Disney’s Babble, and the TODAY Show. On a summer visit to Conneaut Lake Park, Ron became suddenly fascinated with the park’s origins, a fascination that lead to his current book project, and later would evolve into a passion for the county’s extensive history. 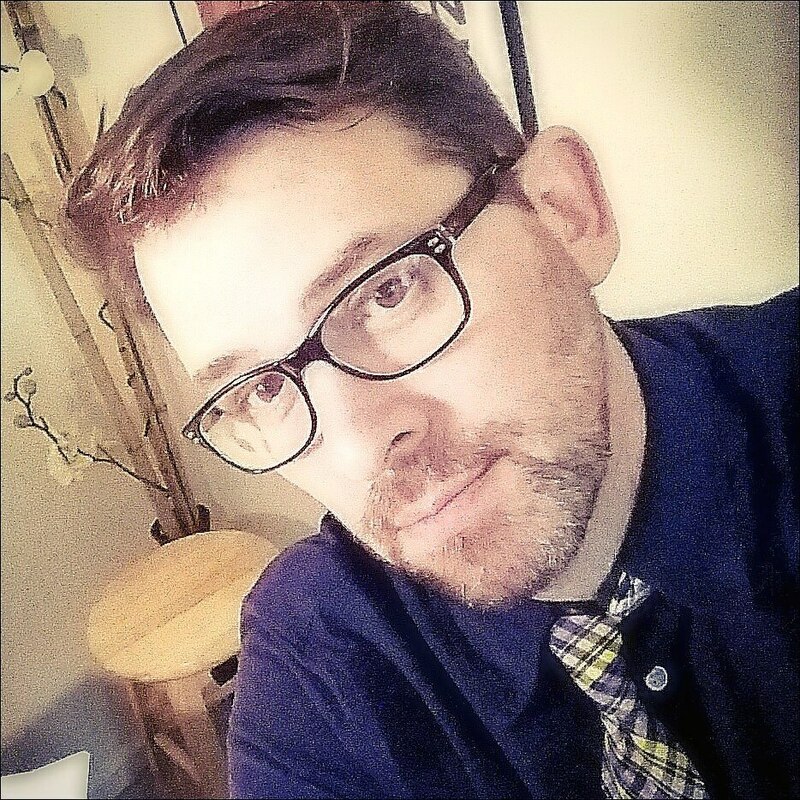 Today Ron is the Director of Digital Marketing Services with at Aptera Inc., in Indiana where he lives with his three sons. He graduated from St. Edwards University in Austin, Texas with a degree in English Literature, and is a member of both the Crawford County and Conneaut Lake Area Historical Societies. Next Get Your Alfonso Fugagli 2019 Calendar!